However, for any number of reasons, JS Tracking may not be accurate for everyone. The most popular alternative solution is Web Log Analytics. It allows you to collect web server log files and import them into your analytics platform for viewing, analyzing, and reporting. It is offered by companies like AWStats, Webalizer, and several others. 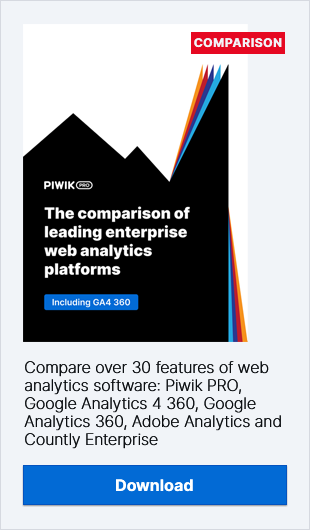 We here at Piwik PRO also deliver log analytics for customers requiring superior security and data protection. Those two methods of collecting information differ a lot when it comes to the processing and storage of data. Therefore, they may provide you with different numbers in particular metrics. If your organization handles sensitive information (like in the banking or healthcare industries), you should choose Log Analytics. It offers security features which far surpass those offered by JS Tracking. If you need to track activity on a particular server for administration purposes, testing, debugging, fighting spammers, and others. If you want to analyze historical data from your log files. You can import months of server access logs to your platform and get access to valuable data. This is possible even if you didn’t have any analytics software implemented before. If you like this infographic, feel free to share it with your network! Every share is a thumbs-up for our Content Team!